Just when I thought I was slowly getting my knitting mojo back, I had to go and do something stupid. Like knit three quarters of my second sleeve with the wrong size needle! I'm so disgruntled. Nothing is more disheartening than to think that your project is almost finished just to discover that you have to go back a few steps. It's like the light at the end of the tunnel has zoomed out and made that tunnel even longer. I shake my fist at you knitting gods! Yesterday my internet was down for a good chunk of the day (personally, I think we need a new router), not that it mattered too much as it was an absolutely gorgeous day and it would've been a waste to spend it inside. So the Munchkin and I went for a walk, which turned into a yarn-bombing tour. I'm quite surprised as to how many yarn bombings have taken place in my area. When we returned home I managed to get the Munchkin pretty occupied for a bit by building a Lego fort so I was able to knit up a good amount of the sleeve. 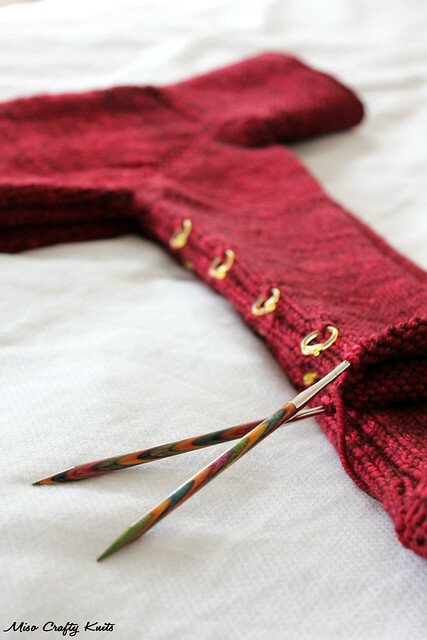 I'm hoping to get this cardigan done this weekend, if not by the end of the day. That is, if Brett doesn't doesn't come home with any more bags of Lego. I kid you not, the other day he came home with a few bags of Lego that a co-worker had given him. She forewarned him that they were most likely going to be really dusty as her boys are all grown up now and they haven't been played with in years. She wasn't kidding, So on Wednesday I spent about 8 hours cleaning and disinfecting sink fulls of Lego. With a toothbrush. Not fun. Times like these I wish I had a dishwasher! But all worth it to see how much joy the Legos bring the Munchkin and how completely absorbed he can get with them. Which is awesome for me cause then I can sneak in a few minutes of knitting. Or a load of laundry. But back to the cardigan. Hopefully I won't run into any more problems. I don't think my knitting confidence can handle any more beatings. I think I'll be working on Nuvem at knit night. There's no way I can screw up simple knitting. Or can I? I'm a sewer rather than a knitter ... so I'm not sure what you mean by 'yarn-bombings' in your area ... it sounds nasty, but somehow I don't think it actually is ... care to enlighten? Or is it an insider secret? Oops! So late in responding to this! A yarn bombing is when a knitter or crocheter take a piece of knitted/crocheted fabric and wraps it around something...usually without anyone noticing...and sews it up. I've seen stop sign poles, a parking meter, and one of those thick met chains to fence off a driveway all wearing a "bracelet" of sorts. There was a statue wearing a legwarmer, but it has since been taken down. What a bummer to have to frog a whole sleeve! I've had this sweater in my queue for a while and I'm looking forward to seeing yours - the colour you chose is the bomb. Speaking of bombs, I did a bit of yarn bombing on our front lawn tree last fall. Feel free to check it our here: http://stitchparade.com/?p=903 Happy weekend! At least the sleeve was somewhat quick to re-knit! Phew!